It was Showtime for us—properties to visit, bucolic roads to travel, sights to see and charming little village trattorie, ristoranti and enoteche to go to for food and refreshment. Our itinerary included four days and four nights in the Tuscan countryside during which we would call on two dozen or so villas and actually stay in three of them—a guest house at villa Impruneta in the town of the same name, then villa Isabella (formerly villa San Virginia) on the San Stefano estate near San Gimignano, and finally villa Aiola outside San Casciano Dei Bagni. 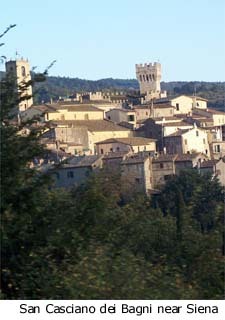 Driving through Tuscany and experiencing the region's towns and hinterlands is fairly indescribable. Highways and autostrade are fabulous and local roads are well-maintained. The scenery is dramatic, virtually breathtaking. As we motored from villa to villa we encountered one calendar-worthy photo op after another. The rolling landscape and the vistas it creates are endlessly beautiful, and off the beaten track they are all yours. Our locales included Impruneta and the village of Galluzzo, just outside Florence, then a number of places in and about Chianti such as San Gimignano, Colle Val D'Elsa, Montaonine, Montespertoli, Siena, Montalcino, San Casciano Dei Bagni and Cetona. San CascianoBefore returning to Rome we engineered a side trip to the Maremma coast and Monte Argentario. 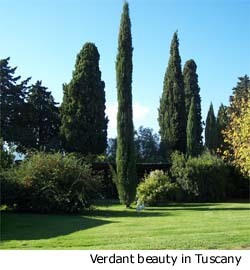 All that, without ever leaving Tuscany! Our dining warrants some discussion, if only to whet your own appetites. Ecco qui! In Impruneta we had dinner at "Il Battibecco," where Suzanne enjoyed a salad of local porcini mushrooms with fresh grated parmesan, and followed that with filet mignon and white truffle sauce; our wine, a Sicilian red. The next night near villa Isabella we went to "Casi Masi," where we ordered an appetizer of pasta with ricotta and spinach followed by a salad smothered in mozzarella and truffles. Crème brûlée followed. In the village of Montaione we ended up at “Carpe Diem,” where I had a salad of smoked goose breast followed by spring lamb with roasted potatoes. Fabulous! 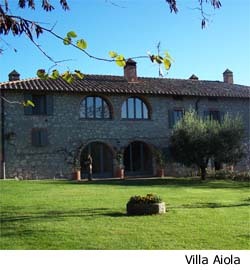 When we stayed at Aiola, the caretaker Julia prepared us pasta with cherry tomatoes and beef filet over arugula, then a dessert plate of fresh pears and pecorino cheese. Of course we were here to see villas, and we did so, ardently. In no particular order, some of our favorites included the following: Six-bedroom Aiola, just mentioned, is just to the south of Siena and occupies a private estate of some 1,700 hectares. It radiates warmth and personality, with cozy rooms, family pictures on the walls, and soothing colors. Six-bedroom Mimmi is an interior designer’s dream—unique, adult and avant garde, with high ceilings and a Zenlike pool retreat. 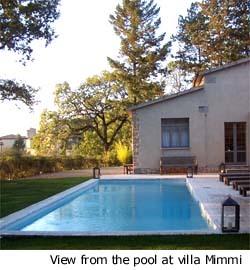 Villa Geggianello is probably the best five-bedroom property Wimco offers in Italy, given that every bedroom there is a virtual master suite. Six-bedroom villa Isabella is modern in the polished St. Barth vernacular, recently rebuilt from the ground up. Finally, two others that really caught our attention were villa Sassaia and Il Palazzetto. Once back at the Condotti for our last night, we ventured out to one of my favorite local spots, a little wine and antipasto bar called "Entonechia," for a nice bottle of pinot grigio, a mushroom pizza, bruschetta, and a buffalo mozzarella salad. We talked about how warm and genuine and welcoming Italians are toward passionate visitors such as we, how much they appreciate the cultural bond they share with us despite the vagaries of international politics.